Newer, more efficient systems now offer legitimate space heating alternative in colder regions like the Northeast and Midwest. Note: If temperatures in your area drop below 10 to 25 F, you will need an auxiliary heating system (depending on the size of the system). No energy loss through ductwork, which accounts for more than 30 percent of a home’s energy use for space heating/cooling. Heat pump systems should be installed by a licensed professional. 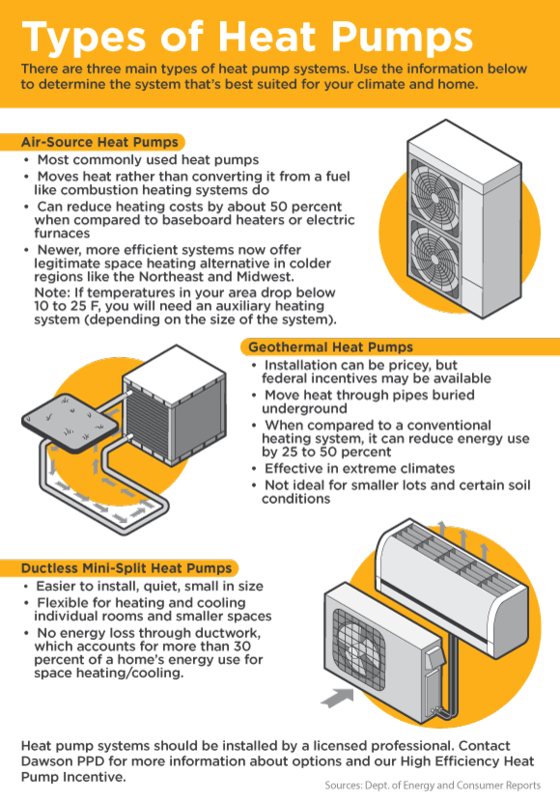 Contact Dawson PPD for more information about options and our High Efficiency Heat Pump Incentive.